Different variations of this recipe have been around for years and it is still a favorite for summer get-togethers. If you like foods on the spicy side, use refried beans with jalapenos or add a layer of sliced jalapenos. This dish can be made several hours ahead of time and chilled to allow the flavors to blend. As an added bonus, if you have any leftover (although that doesn't happen very often..lol) a scoop of this next to scrambled eggs is delicious! Using a 9 X 9 inch pan, combine the refried beans, taco seasoning mix, garlic powder and garlic salt, stirring with a fork and then smooth the mixture into the corners of the pan. Now you will start to layer the dish. Smooth the sour cream onto the bean mixture, reaching all the way to the edges of the pan. Next smooth the guacamole over the sour cream, and follow with the layer of salsa. 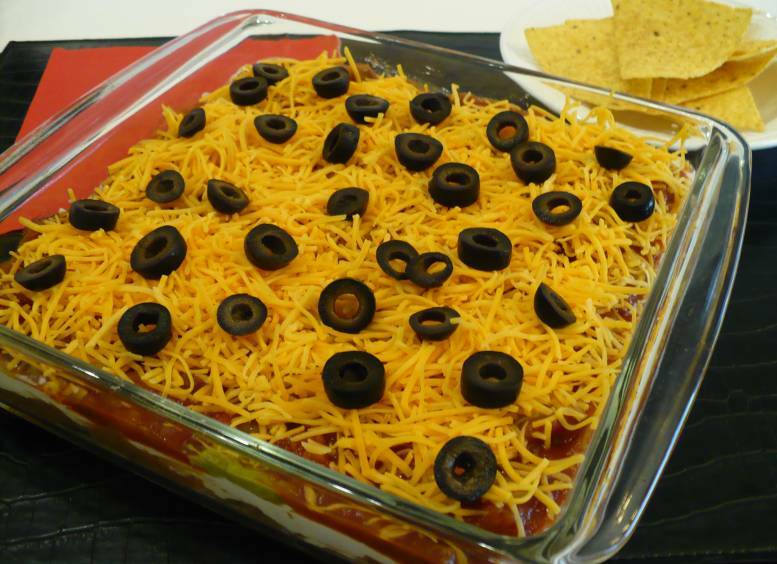 Sprinkle cheddar cheese over the dish and top with the sliced black olives. Serve with tortilla chips.